On January 1st of this year, the price of one Bitcoin was $997. By August, Bitcoin had more than quadrupled in value to reach over $4,000. Another popular cryptocurrency, Ethereum, has made Bitcoin’s big gain appear relatively small. Ethereum’s year-to-date performance has reached over 37-fold at times. Many other cryptos have gained at least 100% this year… and made people huge sums of money. We’ve been asked this question many times from both subscribers and gold industry insiders. Regular Katusa Research readers are familiar with the allure of owning gold and its long history as money. People have used gold for thousands of years because it is portable, durable, anonymous, divisible, convenient, and consistent around the world. And most importantly to many people, gold cannot be debased by governments like paper money can be. To fans of cryptocurrencies, those are familiar words. They own cryptos for many of the same reasons. They love the idea of owning money that isn’t controlled by a government. But is there enough of these people now – and will there be enough of these people in the future – to deal a serious blow to gold demand? Will Bitcoin supplant gold in the hearts and minds of those who value privacy, sound money, and liberty? Let’s start answering that question by seeing what’s happening now. First off, let’s look at how much total dollar value has been traded in gold compared to the cryptocurrency sector. 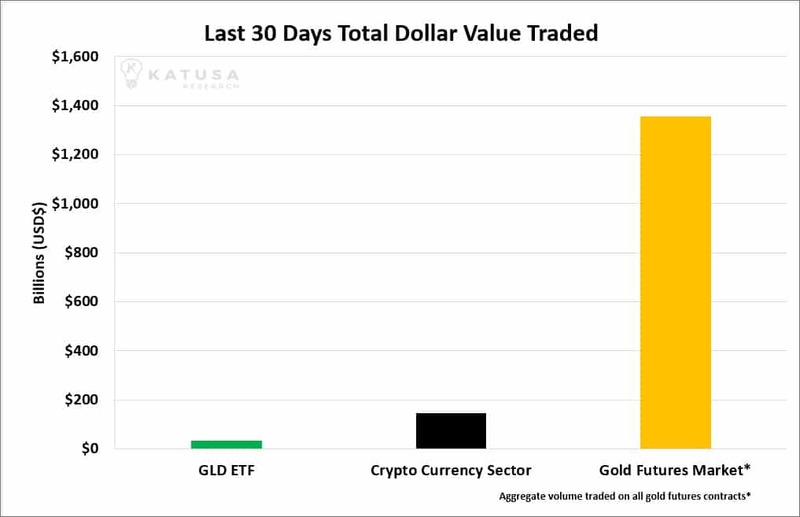 Below is a chart which shows the last 30 days total value traded in U.S. dollars, the big gold ETF (symbol, GLD), the combined cryptocurrency market, and the total gold futures market. We can infer a few things from this chart. First off, the gold futures market is primarily traded by large gold companies, professional traders, and institutional money managers. The group traded over $1.3 trillion worth of gold over the past 30 days. This means that the largest funds and traders still favor gold over cryptocurrencies. But that makes sense because mandates at most major funds don’t allow them to buy cryptos. This will start to change. Many funds that aren’t buying and selling cryptos will do so in the future. The average retail investor doesn’t have access to or the capital for the gold futures market. This guy will often buy the gold ETF to gain exposure to gold. However, a good portion of those potential gold ETF buyers are buying cryptocurrencies now. The cryptocurrency market has traded over 350% more on a total dollars traded basis than the largest gold ETF, GLD. The cryptocurrencies trade 24 hours a day, 7 days a week. Money never sleeps in the crypto world. Their exchanges are never closed. The gold futures market trades 24 hours a day for 5.5 days a week. The gold ETF has the fewest trading hours. The market for the ETF is only open 6.5 hours a day, 5 days a week. And if we rewind the trend search even further back to 2011, we can see in the chart below that interest in the gold price remained steady (with some wild exceptions). Interest in the Bitcoin price came from nowhere and is accelerating fast. I also believe cryptocurrencies and blockchain technologies have eaten into the cash available for speculating in junior resource stocks. For example, a cryptocurrency-mining company called HIVE Technologies recently went public and attracted huge amounts of interest and money from investors. It was backed and publicized by two guys known for their work in the natural resource sector, Frank Giustra and Frank Holmes. Every dollar of speculative investor capital going into HIVE is a dollar that isn’t going into junior resource stocks. Because of the success of HIVE, I expect to see similar offerings in the future. The typical buyer of these offerings will be someone who wants high-risk, high-reward speculations. That’s also the typical buyer of junior resource stocks. So, I expect future crypto-related currencies and securities will draw even more money that would otherwise be destined for junior resource stocks. ***With the data and anecdotal evidence provided above, I think it’s safe to say that Bitcoin and other cryptocurrencies are drawing money away from gold-related securities like ETFs and junior gold stocks. I believe interest in cryptos will only grow in the future. However, if cryptocurrencies want to go truly “big time” and draw some of the trillions of dollars of institutional money that typically invests in stocks, bonds, real estate, and commodities, they will need to take a big step. Currently, there are over 1,100 different cryptocurrencies which can be traded on over 100 different exchanges. Many of the fly by night cryptocurrencies and exchanges will turn out to be scams, just like many fly by night Internet stocks in the early days, or mining stocks of the past. Regulations will come into the cryptocurrency sector — like it or not. Sorry libertarians. I know it’s not what you want to hear, but it will happen. We are in the early days of the blockchain and cryptocurrency revolution. But for the cryptocurrencies to go mainstream, I believe the large investment funds will have to be able to access the platforms to speculate in the sector. That is not the case today for various reasons, including their own fund mandates and the lack of being able to wire funds from bank accounts to digital platforms (exchanges) to buy and sell cryptocurrencies, among others. More importantly, there is a lack of being able to wire back the funds directly back to bank accounts. When I personally sell a stock on a stock exchange and then transfer the funds out of my brokerage account to my bank, I do so directly from my brokerage account to my bank account. That is not the case for many of the platforms to trade cryptocurrencies. An intermediary (a “wallet”) is required, and that introduces an unnecessary step in the transaction chain. There are so many wonderful elements to the blockchain potential, but for the big funds to be able to play the sector, the industry will have to evolve. But a solution will come that will meet the needs of large fund managers. And the exchange that achieves that will get massive adoption rates from the big money on the sidelines waiting to be able to get exposure to the sector. When this comes, it will be a huge step forward for cryptocurrencies. Bitcoin and all the other cryptocurrencies are gaining traction, that is clearly shown by trading volumes and Google search data.But the traction the cryptocurrencies have gained is NOT killing the physical gold market. However, I do believe the junior mining executives will have to do a better job of retaining and attracting the speculative dollars available to buy their stock. Now, more so than ever, speculators have access to new or previously forbidden sectors like cryptocurrencies and the 400+ marijuana companies in North America. Weak and struggling junior resource stocks will wither and die at faster rates. Like it or not, gold executives and gold investors, you have a major new competitor in the form of cryptocurrencies. P.S. One last interesting fact related to gold, Bitcoin, and dollars: Recently Puerto Rico was devastated by a hurricane. Gas stations and convenience stores were accepting U.S. dollar cash only. Gold, silver, and Bitcoin were not accepted forms of payment. The U.S. dollar still has plenty of life left in it.